This large multinational organisation decided to consolidate all of the KPIs used worldwide into one single taxonomy. This was originally specified in an Excel Workbook. The project goal was to simplify this data and create an application that can easily be updated (nodes added, updated or removed in the overall structure) and publish this information in an engaging way that would enable employees to navigate up and down the KPI hierarchy and (eventually) enable personal selection of KPIs that are linked to their individual performance plans. 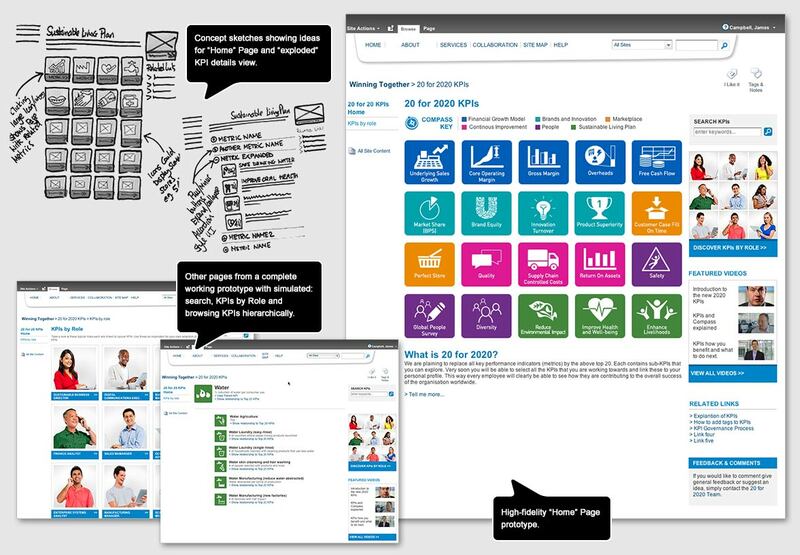 Top 2o KPI application delivered using the Sharepoint platform for the company Intranet. This was a huge success. It was designed and delivered in a very short space if time (from sketch to golive in 8 weeks). This first phase enabled the navigation of the entire KPI hierarchy and detailed inspection of any KPI. Different search strategies were implemented including: browsing hierarchically, keyword search and searching for KPIs by role.